PacXpert™ Packaging Technology, from The Dow Chemical Company (also known as “Dow”), bridges the gap between flexible and rigid packaging. This innovative flexible stand-up pouch offers the same durability as rigid packaging but offers savings in areas such as transportation, warehouse storage, and displaying on retail shelves. 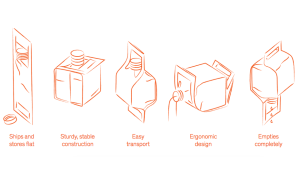 As the product is used, the packaging folds over itself, further optimizing storage space, and consumes minimal space in a landfill after use. PacXpert has earned numerous packaging awards for its unique ergonomics, durability, and shelf appeal. With the addition of dual handles, as well as the placement and angle of the seals, PacXpert won’t burst or break during transport. The gusseted corners offer durability and secure handling. This packaging also displays four sides of advertising space and custom print options, as well as the option for a transparent window to reveal the product inside. PacXpert accommodates a variety of reclosable fitment options to suit a vast assortment of product applications. Product options include both edibles and non-edibles. Edible examples include Oils, Condiments, Sauces, Soups, Honey, Syrups, Water, Juices, Dry Pet Food or Treats, Rice/Grains, Breakfast Cereal, Dry Baking Products (flour, sugar, etc. ), Ground Coffee, Snack foods, and more. Non-edible examples include Paint & Coatings, Detergents, Cleaning Products, Motor Oil, Fuel Additives, Seeds, Cat Litter, De-icer Pellets, Fine Aggregates (filter sand), and many more. 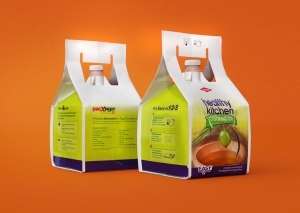 The PacXpert Technology is suitable for packaging anywhere from 1 Liter to 20 Liters of product. Depending on the product owner’s choice and the appropriateness of the product, PacXpert can be made with RecycleReady Technology, a film constructed with multiple layers of poly-laminated polyethylene (PE/PE). This innovative packaging concept offers all the benefits of PacXpert with the additional advantage of sustainability. After the time of use, PacXpert manufactured with RecycleReady Technology can immediately enter the recycling stream found in pre-existing PE film drop-off containers often found at grocery stores, home improvement centers, and department stores.